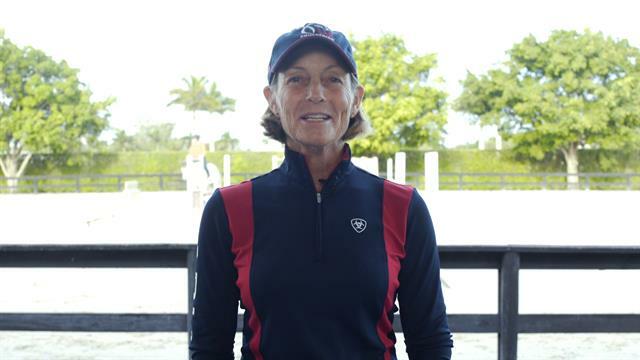 Five-time Olympian and 2017 Show Jumping Hall of Fame inductee Anne Kursinski, riding Morgan Hoffman's Charmedino, demonstrates one of her favorite exercises to help find a distance to a jump. This progressive counting exercise can be performed with either a single jump or a pole on the ground. Anne Kursinski is a show jumping legend. The five-time Olympian earned two team silver medals—with Eros at the 1996 Atlanta Games and with Starman at the 1988 Seoul Games, where she also tied for fourth individually. She was perhaps best known for her incredibly consistent brilliance with Starman, her mount for three FEI Nations Cup™ wins in 1987, the team silver medal in Seoul, and her Grand Prix of Aachen win at the CHIO in Aachen in 1991 – making her only the second woman to ever win the prestigious event. Kursinski also was the first American rider to win the Grand Prix of Rome (1983) aboard Livius. She also has been a member of three U.S. Teams for the FEI World Equestrian Games™(WEG). She was inducted into the Show Jumping Hall of Fame in 2017. In 1988 and 1992, Kursinski was named the American Horse Shows Association’s Horsewoman of the Year, and in 1995 she was named Equestrian of the Year, among countless other accolades. She is a United States Hunter Jumper Association (USHJA) clinician, a member of the USHJA executive committee, the United States Equestrian Team’s board of trustees, and US Equestrian’s board of directors. She is Assistant Chef d’Equipe and Development Technical Advisor for the U.S. Show Jumping Development program and was a selector for the 2014 WEG bronze medal-winning U.S. team in Normandy, France and the 2016 Rio Olympics’ silver medal-winning U.S. team. She has also been an analyst on show jumping telecasts. Follow Anne Kursinski via her website and on Facebook, Twitter, Instagram, and YouTube.